LEFT: ACE OF WANDS REVERSED. The Ace of Wands is usually an exciting card to get, representing the potential of new ventures, creative pursuits, relationships, etc. When it’s reversed, you’re not likely to get the outcomes you want by striving, so don’t. The reversed Ace of Wands speaks of setbacks, obstacles, and a need to manage our expectations. This might not be the best week to push for that deal or ask your crush if they’d like to hang out. That’s Not a bad thing – why not conserve your energy for a better time? 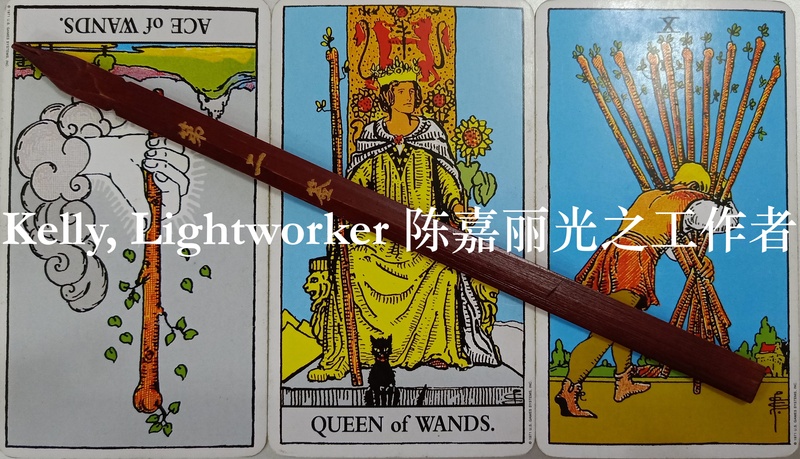 MIDDLE: QUEEN OF WANDS. This card encourages us to be confident, to strut our stuff, to know that we deserve the best. It’s also a subtle warning to stay away from drama queens and bitchy relatives (those of you going for New Year visits this week will know what I mean). Having said that, there will also be good people keeping an eye out for us (the Queen of Wands often refers to a friend, mentor, or strong person in your life who is helpful and encouraging). So it’s not bad at all! Notice the Queen of Wands just sits on her throne, holding her wand of power, staring into the distance, her faithful black kitty seated before her. In this reading, she’s looking mighty relaxed. Let’s take a cue from this queen, sit back, and watch the world go by for a bit. RIGHT: TEN OF WANDS. This is the Burnout Card – no two ways about it. So much is going on that you’re barely keeping one foot before the other along your weary path. It’s time to look up and around you – a higher perspective (and some much-needed rest) will do wonders. Beware the decisions you’re making at this time – with the Ten of Wands, it’s likely you’re focusing on details too much and missing out on the big picture. The young whale lies low on the river bed. Noble One, do not aim too high for now. Then, in one leap you will clear the Dragon’s Gate. In the same vein as the Tarot, this week’s Goddess Divination reading urges us not to rush something that isn’t ready. If the time is not now, then wait, and forebear the inconveniences of waiting. But trust that your patience will pay off – there is great power within you if you’re willing to acknowledge and take responsibility for it. For now, bide your time and be flexible with expectations. Align yourself with the highest and greatest good. Let the Divine guide you in all your ways. Your day will come. the goddess promises you this.